Injured? Free Consultations to Victims of Bird, Lime, Jump, Muving Ecosystems, and Ofo Electric Scooter, Dockless Bikes, and Moped Accidents in Atlanta Georgia. Attorney Wes Pickelsimer fights hard to get injury compensation for victims of Bird scooter accidents in Atlanta and all throughout Georgia. Rental on demand scooters and mopeds such as Lime, Bird, Muving Ecosystem, and Ofo are a relatively new phenomenon that has been taking over the streets of in-town areas of Atlanta. These are otherwise known as shareable dockless mobility devices. They have already swarmed many other urban areas across the USA. They’re a hit among the younger crowd because they are motorized, app-based, relatively cheap, and highly convenient. All riders have to do is reserve a nearby scooter on the company app, ride to their desired destination, and lock the scooter with the app. Already, Bird and Lime have faced considerable controversy since deploying their first fleet of scooters in 2017. The scooter-sharing startup Bird recently settled a legal battle with the city of Santa Monica, who took umbrage with their failure to secure business licenses and vendor permits before launching. These companies rushed to market in the way Uber did when it first started. 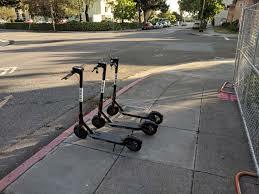 Additionally, many locals have deemed Bird scooters as a public nuisance; they say that the company’s lock-it-and-leave-it policy is encouraging riders to clutter sidewalks and other inconvenient spots around the city with thoughtlessly discarded scooters. The Atlanta Journal Constitution recently wrote about the upcoming prevalence and issues here. The City of Atlanta has made it crystal clear that you are not allowed to ride a scooter on the highway! Whether Bird, Lime, or others are intentionally flouting legal issues and disregarding communities in their mission towards lightning-fast proliferation and profit is a matter of opinion; however, what isn’t left up to debate is the fact that inadequate regulations have made these scooters dangerous. Almost all of the companies have imbedded waivers in their contracts that disavow liability on behalf of the user. First, Bird and Lime scooters can go as fast as 15 miles per hour, a level of speed which the casual rider may not be ready to handle. People who ride beyond their ability (which happens more often than one would think) pose a danger to the pedestrians around them as well as themselves. In fact, there has already been a report of a Bird scooter vs. car accident in which a female rider sustained moderate head trauma. Second, a person can trip over a scooter left on a sidewalk and sustain injuries from the resulting fall. As previously mentioned, riders all too often leave scooters in unsafe areas. Finally, a defective or discharged scooter can malfunction, causing a rider to fall and injure themselves. If you have been injured in an accident involving a Bird electric scooter or any motorized scooter, you may have a case for compensation. It is highly advised that you get professional legal representation as soon as possible. An experienced Bird or Lime scooter accident lawyer can handle settlement negotiations with the insurance company on your behalf to ensure maximum compensation. If you have been injured in an accident involving a Bird electric scooter or any motorized scooter, you may have a case for compensation. It is highly advised that you get professional legal representation as soon as possible. An experienced Bird scooter accident lawyer can handle settlement negotiations with the insurance company on your behalf to ensure maximum compensation. We offer free consultations. We charge zero upfront fees. You only pay if we win, so you have nothing to lose by speaking with us. Contact us now and we will immediately send an investigator out to you, whether you’re at home, in the hospital—wherever. Our one and only goal is to protect your right to full and fair compensation for your damages. For a free case evaluation with an experienced Bird scooter accident attorney, call (404) 610-4429. Our line is open 24 hours a day, seven days a week. We always respond within an hour—usually in much less time—to every single call we receive. You have our full attention.